This book is an adaptation of Rhona Reagen’s 60 Seconds to Excellence for Violin and Viola. Rhona is an inspirational and well respected Studio Teacher of over 30 years as well as Conductor and Chamber Music Coach at Midwest Young Artists. Her work with students aged 4-74 is well respected in the Chicago area. Rhona was chosen as ASTA’s Studio Teacher of the year in 2008. This book is designed to be used as both a warm up for general playing as well as remediation for specific challenges. It is divided into three sections. Each exercise is meant to be played on EVERY string. The exercises are short and simple so that the player can focus on the technique and not be visually distracted by the music. This also helps facilitate memorization. 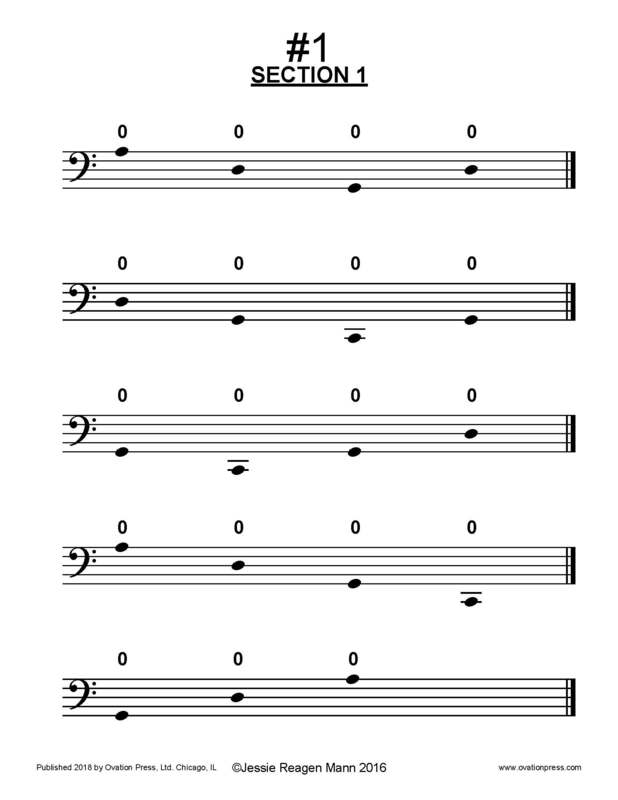 I ask students to first play these exercises while reading the music and then again with their eyes closed. This repetition accomplishes two things; the cellists are able to both listen to themselves more carefully, as well as train their ears and fingers (through muscle memory) to play accurately while giving equal attention and focus to each string. It is important to remember to support each finger with the stronger fingers below. For example: while playing the 3rd finger, the 1st and 2nd fingers should also be on the string; this is true while playing the 2nd or 4th fingers as well. Fingers should rarely be on the string alone with the exception of the 1st finger. The first section is a series of exercises that are best used as a general warm up. Each exercise allows the player to focus on one specific area. 60 Seconds to Excellence focuses on the left hand shape and accuracy of the fingers, but the first exercise is a great reminder that to focus on the left hand, the right hand must be also be confident and secure. This is the only exercise that focuses on the right side of the body. Playing open strings helps the player focus on many issues - basic body balance, bow hand shape, bow placement on the string, and left arm weight. I encourage students to start slowly and use this as a daily check in to set up their postures before beginning to play anything else. The second exercise focuses on left hand balance and finger isolation. It’s great for approaching new instruments (when young students move up a size) or after not playing for a while. Experience has shown that when a cellist spends a few minutes on these each day, they significantly reduce positioning errors and greatly improve the accuracy of a practice session! The second section of this book addresses specific intonation challenges. Balance should be over the second finger, not the first finger, to effectively balance the hand. When balance is placed over the second finger, the notes are easily played in tune. The hand is then free to pivot and play both backward and forward extensions accurately. When extending down the fingerboard, it is important for the thumb to ALWAYS follow the second finger to maintain left hand balance. The third section of this book focuses on shifting. Once the student understands how to correctly focus the balance of the left hand and is secure with their overall posture they are ready to start shifting. For students beginning to shift I will put a star (or small smiley face sticker :) for the 4th finger between the D and G string. This is one of the first major shifts needed in cello playing, and when it’s secure, the cellist is often a more confident player. The exercises in this book focus on chromaticism and substitution. These exercises explore the often overlooked shifts to 2nd, 3rd and 4th positions. 60 Seconds to Excellence has been successfully used by beginning, intermediate, advanced and professional players. While the exercises may look simple, they are beneficial for everyone!